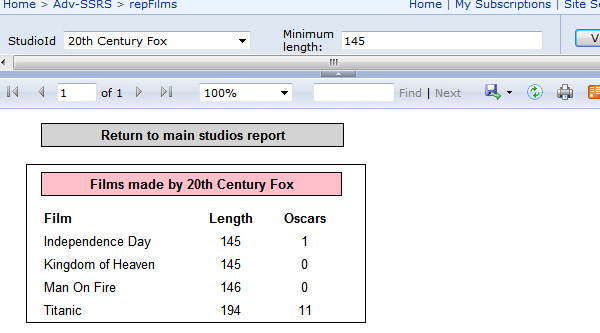 Many people on our Reporting Services courses ask if they can customise the appearance of the SSRS parameter bar. The answer is yes ... but see this hint. I'd recommend not customising the parameters bar. You'll spend days (weeks?) playing about with the CSS style sheets trying to get everything right - and even then you're vulnerable to Microsoft releasing a new version of SSRS which will change the way things work. Far better to manage your users' expectations! The parameters bar as it appears by default. However, some changes aren't necessarily an improvement! Here we've applied a pink style to the parameter bar. Still interested? You'll need to learn how to configure Reporting Services to use a different style sheet, and then create this extra style sheet - all of this is described in the rest of this blog. You'll need to know CSS to customise the parameters bar. You can see a tutorial on CSS here. This is because I have a named instance of SQL Server called SQL2008R2 installed, and more than one copy of Reporting Services running. Your folder path might be easier to find. Here we're telling SSRS to use a style sheet called pink.css. What you now need to do is to create this style sheet! The template provided for editing styles. Here I've already copied it to create the pink.css style sheet. All that you need to do is to copy and paste the HtmlViewer.css template, and rename it to create your style sheet! msrs-topBreadcrumb The top links of the report (Home, My Subscriptions, etc.). MenuBarBkGnd The parameters strip itself. SplitterNormal The line between the parameters bar and the paging toolbar below it. ToolbarPageNav The bar containing tools to move between pages, zoom in, etc. The parameter bar after I'd had my evil way with it. And with that, I leave you to your own devices. Good luck!